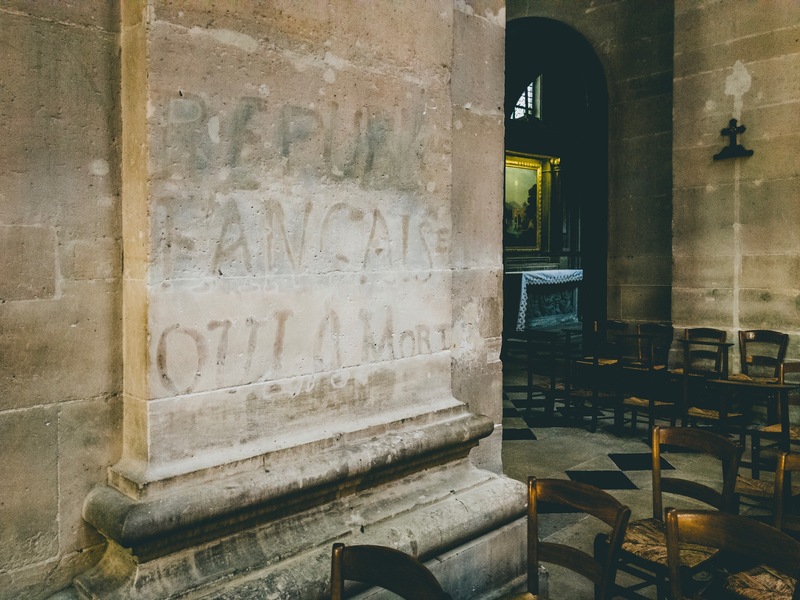 A ghostly inscription hides in plain sight inside Eglise Saint Paul-Saint Louis, a message that despite the church’s best efforts refuses to go away. It’s a cool visual – certainly worth a shutter snap – but it’s also imbued with a captivating story that deserves telling. The year was 1871, and after the disastrous Franco-Prussian War the enemy had invaded France. Most cities capitulated, giving themselves over to Prussian occupation and control. But Paris isn’t most cities. While its government accepted defeat, tens of thousands of Parisians had risen up as an organization called La Commune. In a time of ultimate uncertainly one thing was crystal clear: La Commune wouldn’t give up their city without one hell of a fight. This motivated group of men and women – brave heroes to some, filthy anarchists to others – resisted the French government’s cowardice and fought back at every turn. They built barricades, toppled State property (goodbye Tuileries palace), and even publicly executed their enemies in an effort to turn the political tides. These skirmishes culminated in La Semaine Sanglante, or “The Week of Blood”. It saw French soldiers, known as the Versaillais, being ordered to storm Paris and neutralize the resistance movement. If they had to kill their fellow countrymen, so be it. 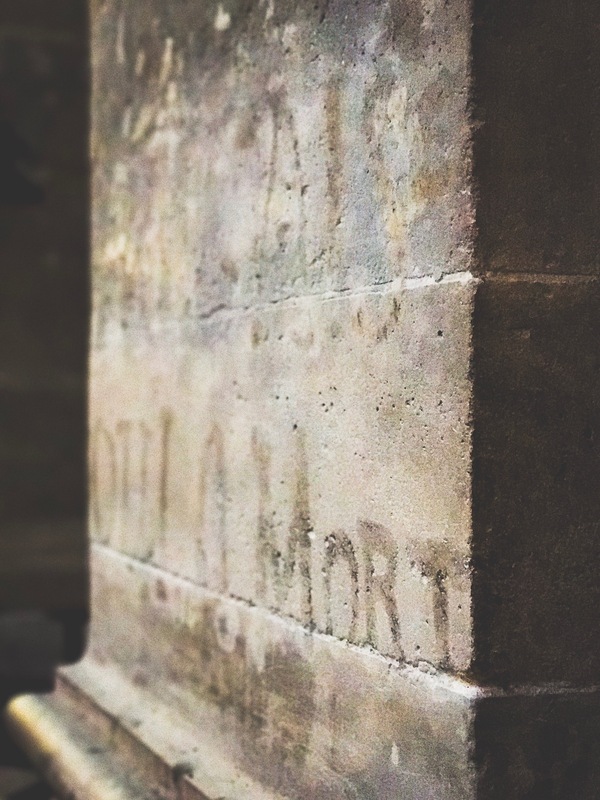 One of the bloodiest battles took place in the Marais outside Saint Paul-Saint Louis, with resistors retreating to the church and fighting from within it. 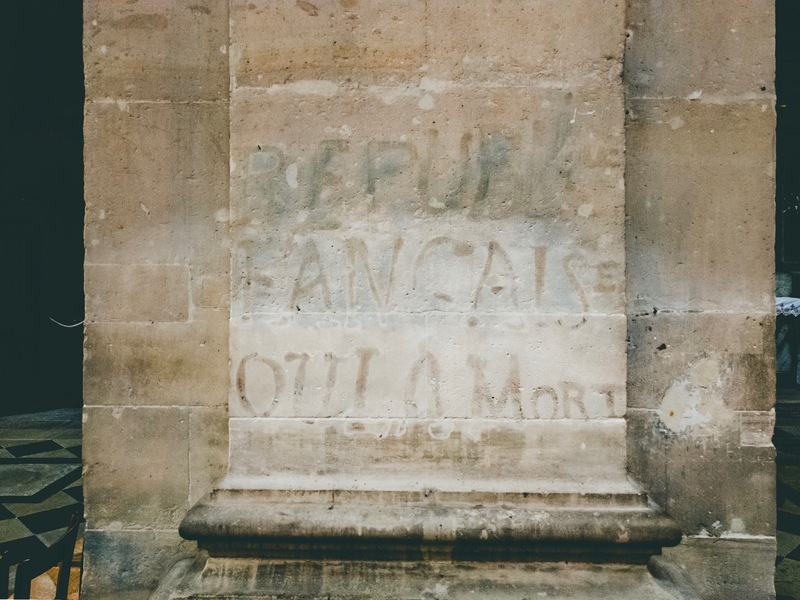 During the chaos one of them frantically scrawled a message that says REPUBLIQUE FRANCAISE OU LA MORT – “FRENCH REPUBLIC OR DEATH”. For years afterward, the church tried to scrub away the dark memory of the battle that took place within its walls. And because La Commune was an enemy of the Church (some of those public executions were priests), all the more reason to cleanse the dirty “sins” of the rebellion. But one problem: the message refused to go away. After each washing it reappeared, sometimes even becoming more prominent. Eventually the church gave up and today for those in the know, the history is still there to be discovered. What did this man use to write such a mysteriously invincible piece of grafitti? Acid? Maybe his own blood? Did he die that day, or did he manage to survive La Semaine Sanglante? Approximately 20,000 people would not. 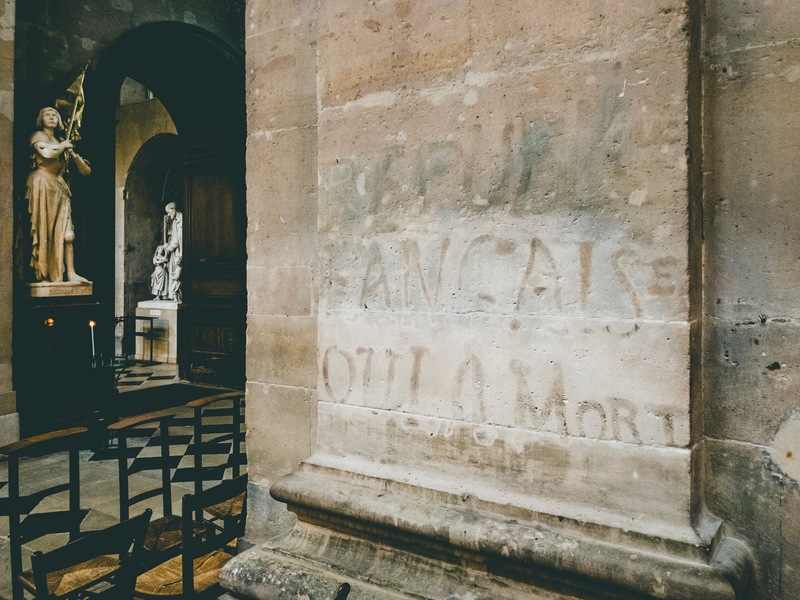 What we do know is that there seems to be a revolutionary ghost in permanent residence at Saint Paul-Saint Louis, with its message of violence and death offering a stark contrast to the serenity of the church. Just another of the treasures in Paris that spark the imagination and make history so much better than in high school! Come see this in person, along with plenty of other historical details, by joining me on a walking tour of Le Marais. You can request dates and pricing here. Enjoyed reading this before I head off for the day. You’re right–I learn more from your stories than I ever did in History class! You make it come alive. Thank you! That pleases me to hear that Linda! Why couldn’t all my history classes take place on the streets of Paris? Is that too much to ask? A question not related to Paris, per say: What font do you use for your Logo? It’s quite beautiful and shows your sensibility as an artist. Very well kerned as well. Hi Nancy, so glad you noticed! The font is Cinzel. I chose it because of its classical and slightly gothic feel. Have a great day! Thank you, Corey, for the font name. I did find it today by using “what the font”. I love the incredible people behind that service but I appreciate your getting back to me here. It is a lovely font and so perfect for Paris information, and as I said before, so well used by you. You are such a wonderful storyteller, Corey. I love that you’ve not only pointed out an interesting tidbit, but that you’ve also given it historical context — and a very human context, too. As I end all of my comments on your blog: Bravo! Thanks my dear Heide! Truth be told I meant to do a breakdown of ALL the treasures in this church; but I soon realized it would be a mammoth blog post! So I think I’ll break it up into more chewable pieces. Hope you’re well. Given the insider knowledge you’ve amassed, listing all the treasures would result in a post that just kept scrolling and scrolling and scrolling! So … good call on the “bite sized” approach. :-) Please keep ’em coming, though — this reader is hungry for more! Fascinating bit of history. In every city, there are small memorials to individual tragedies, if you know (or someone shows you) where to look. Very true! Thanks for stopping by and for taking the time to comment. I look forward to bringing you more fascinating bits! Indeed it is! Pretty great, isn’t it?